Betaworks' Homescreen app reveals the extent to which Facebook is winning the battle for your homescreen, and how most people are choosing alternatives to some of the core Apple apps. 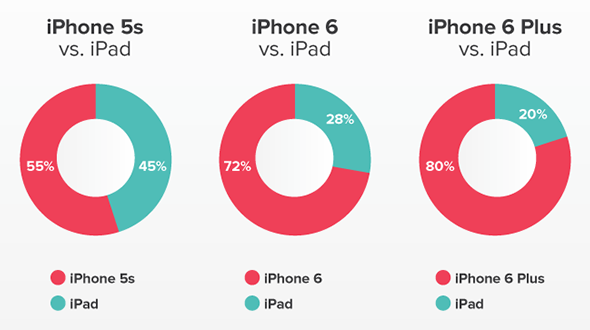 Bigger screen iPhones are eating away at iPad usage according to Pocket study. "Tablets will have to move more rapidly towards more robust content creation features and productivity if they want to remain relevant." Learn how considering the bigger picture, not just ‘your’ part of the process can help ensure your product succeeds. How to channel Batman in your onboarding flow – don’t get in the way but be there when needed. A comprehensive overview of the state of web animation and where it's heading (Web Animation API ftw!). Many designers are having fun exploring what they can do with Google's new design language. Check out this collection of concepts. We love Brian Lovin's design details posts. This one features videos of the finer touches of Lollipop's core OS. A little inspiration for all your image hover effect needs – also applicable to many card-like elements. A new iOS app made for designers and developers who need an easy way to preview prototypes on their device. Wake promises to be a private space for you to share and discuss design work with your team. This new video gives us all a sneak peek.